1 Ptarmigans are arctic birds that live mainly on the tundra. They have round bodies and short tails. They have short, round wings. They can fly, but they spend most of their time walking around on the ground. They have feathers on their feet. These feathers help them to walk on snow. 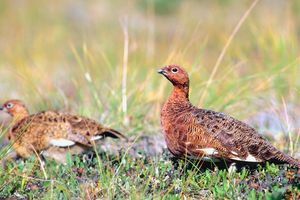 2 Ptarmigans change colors during the year. In winter, ptarmigans are all white. They look like the snow and are hard to see. In spring, ptarmigans shed their white feathers and trade them for mostly brown ones. That makes it hard to see ptarmigans on the ground.